The proposed ordinance would make a new rule that no one can sit or lie on a city street or sidewalk within the mile square between 6 a.m. and midnight. Officials say on any given day in Marion County, there are 1,600 homeless individuals on the streets and many of them remain hidden to the general public. 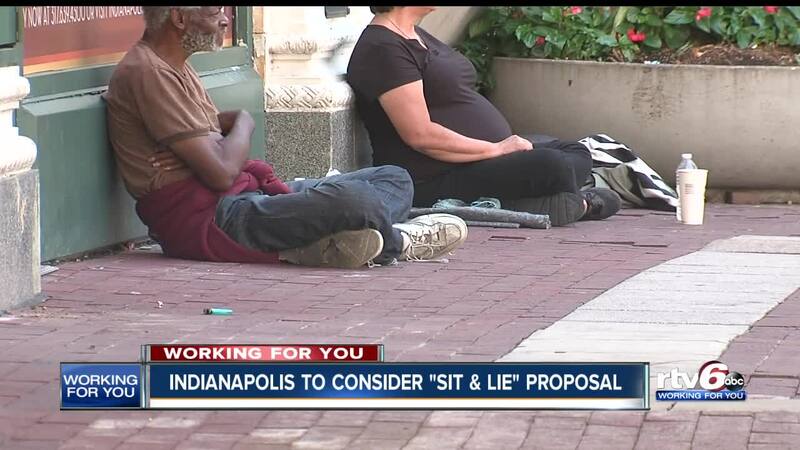 INDIANAPOLIS -- Two city leaders are behind a new plan to discourage panhandling in downtown Indianapolis. The proposed ordinance would make a new rule that no one can sit or lie on a city street or sidewalk within the mile square between 6 a.m. and midnight. Officials say on any given day in Marion County, there are 1,600 homeless individuals on the streets and many of them remain hidden to the general public. Since April 2018, seven homeless camps have been closed, each evicting more than 100 people who were living there. Indianapolis also ranks fourteenth in the nation when it comes to evictions. Republican Minority Leader Michael McQuillen and Republican Councilor Susie Cordi will officially introduce the proposal at the next Indianapolis City-County Council Meeting on September 24. The Wheeler Mission, Horizon House, The Coalition for Homelessness Intervention and Prevention Program, the Indianapolis Chamber and many elected officials are vetting the ordinance.